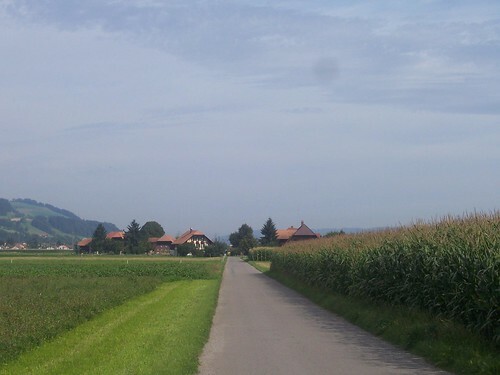 Switzerland Day 6 – go to Bern? What a capital idea! It’s Friday and our sixth whole day in Switzerland, and our final day on two wheels. 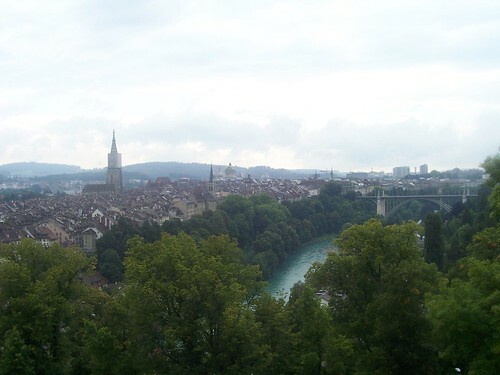 Our destination for the day was Bern, capital city and a UNESCO World Heritage Site. But first we had to get our bikes out of the hotel cellar and wave goodbye to the fairytale town of Th¨n. Our route took us back to Th¨n before heading out alongside the railway line. Before long we’re in fields, ducking in and out of forests and whizzing past farmhouses and fields of sweetcorn, growing tall and high. Occasionally we stop, look back and admire the snow topped mountains – the Jungfrau, the Eiger, the Mönch – in the distance. It’s an easy cycle and there’s little really to stop off at – the odd cow, the occasional village. Next to the sweetcorn, hordes of midges hover around, getting splattered on our arms and faces as we cycle through them, and we stop near an open air swimming pool to brush them off. And then some more off. And more. And just a few more. It’s a quiet day – few people out, just the odd train thundering buy. Local BLS trains. long Intercity SSB trains. International trains from Germany. Then all of a sudden, an SSB train goes by – short and consisting almost entirely of first class compartments, and one “Special Klasse”. With few things to distract us, we’re soon at the town of Belp, and the Bern-Belp Airport which seems as good a place as any to stop for a cup of coffee. Well actually the only place to stop for a coffee. It’s quiet place, the main traffic being private planes and helicopters. It’s sleek, modern looking facilities have a rather empty looking feeling and there’s little happening as we sup from our cups. The weather isn’t so hot and it’s trying to rain as we cycle into Bern’s suburbs, down well marked cycle lanes, with the odd tram line getting in the way. But the trams don’t worry us for long. Soon we’re going downhill on quiet paths, before crossing the river and cycling through the side streets up towards the town, up over the bridge and right into the heart of things. The main central road is a throbbing mix of cyclists, cars, pedestrians and large articulated trolleybuses, all sharing the same space with apparent ease – the long buses comfortably winding their way past groups of tourists crowding round the fountains in the middle of the road. But what’s more striking is the relative lack of cars everywhere. True, Bern is not a big city, but the motorcar does not reign supreme. Bikes are everywhere, buses and trams busy. It’s 12:30 – we’ve covered 32km in a couple of hours but it’s too early to check into the hotel. So we park the bikes up outside and go exploring, and hunting for somewhere to eat – we find the Cafe Rathaus near the green stone town hall. The weather has been good, but as we wait for our food, the heavens open and the rain begins. We skuttle inside to finish our food. Lunch eaten, the rain having stopped, and we start on the Lonely Planet’s walking guide, through the historical town, past the parliament building with its collection of 26 water jets – each one representing one of the Swiss cantons. 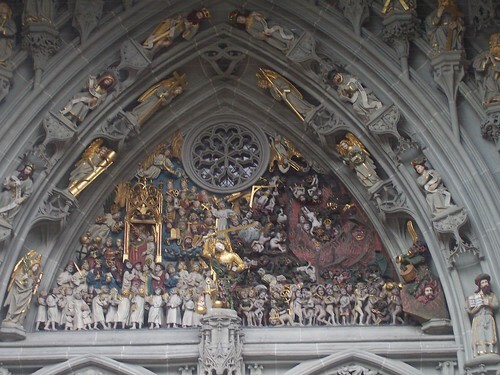 Next stop is the 15th century Gothic Münster cathedral. The entrance way is impressive, but inside it seems rather plain and muted, and frankly not very interesting. 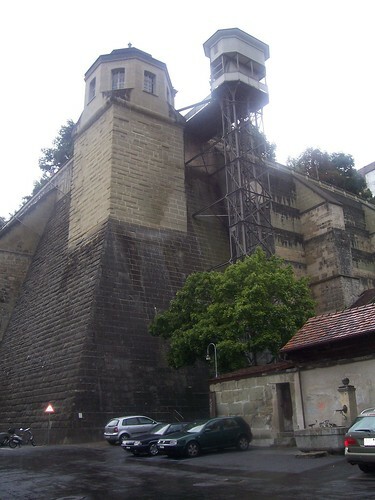 At the back of the cathedral is a small park with impressive views of the town, and a lift down to the Matte district, which sits next to the river. The lift was an amusing thing, playing classical music and with a lift attendant who has put various pictures on the wall. He took money, issued tickets and promptly proceeded to tear them to show we’d paid. Given he was the only one who checked tickets, you did wonder why he bothered but no doubt there is a good reason. On the lower level – hit by major floods in 2005 and 1999 – we stroll along the damp streets, then cross the river not far from where we’d started. Our next stop was the Rose Garden – a lovely place with another superb view of the town. What few tourists there are here, are sheltering from the showers in the park cafe, but we walk round towards the rose section, past a pond full of goldfish. 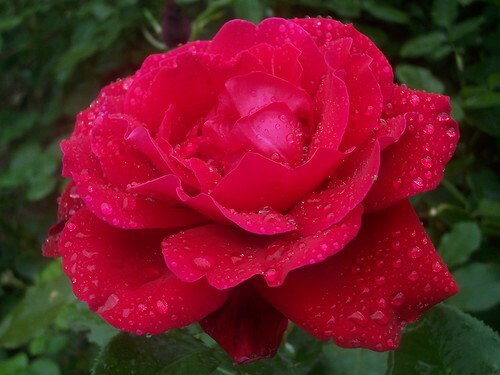 The rose garden is home to a host of different varieties of all shades and hue – all of them sitting with rain drops picturesquely sitting on their petals. 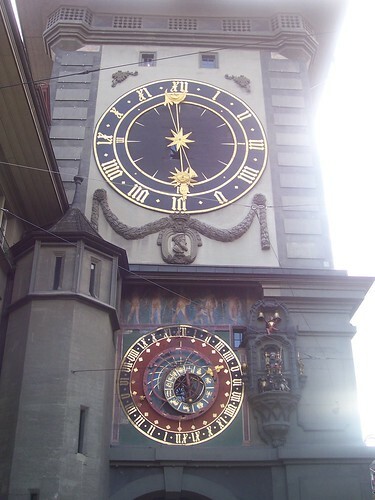 After checking in to the hotel (en-route) and changing our clothes, we finish off the walking tour – back up the central road we’d previously cycled down, up to Bern’s famous clock tower. We head to the Bear Pits – accidentally omitted from our tour. 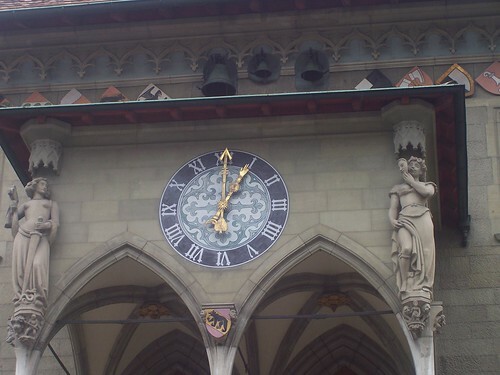 If Bern is famous for anything (other than its lacklustre clock tower), it’s the bear pits. On both days in Bern we managed to miss the bears – or to be accurate, bear – as we arrived after it had gone indoors. There are two pits and only one bear currently lives in them (there used to be five in total according to the Lonely Planet). Until recently there were two, but the second one died. If you’re thinking this looks a rather depressing place to keep a bear, you’re right. It ain’t the best. Keeping bears here is a tradition that dates back to 1441, and this bear park was built in 1857. 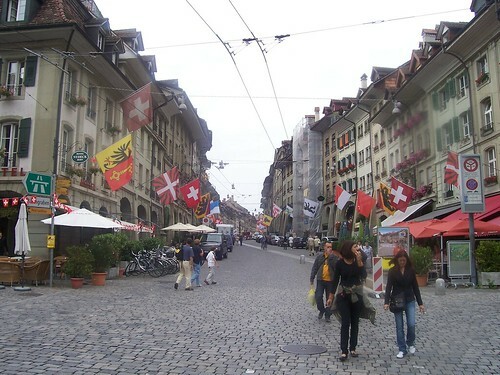 It’s a Swiss heritage site of national significance. And it’s due to change. The city are building a new bear park where the residents will get a much larger area to climb in, fish and play, as well as having sheltered areas where they can pop out to hide from the public if they wish. 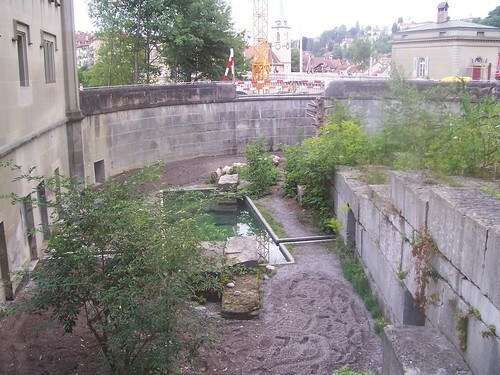 Bern’s bear heaven is due to open in Autumn 2009. That sole remaining bear probably won’t know what’s hit him. Our destination wasn’t really the bear pits though. 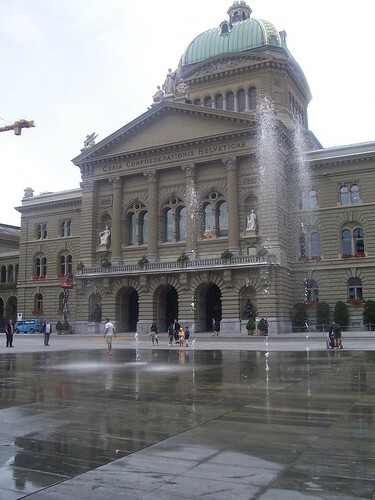 Actually we wanted Bern’s only brewpub – the Altes Tramdepot. As you might guess, the place is an converted church. Well a church to trams anyway. We sat on the outside balcony, overlooking Berne, sipping glasses of home brewed Helles, Märzen and Wiezen, and eat down some tasty food. We’ve barely finished our food when the blue sky that appeared around 6pm suddenly disappears. Gales start – the balcony awnings and parasols flap around in the wind and customers rush inside, whilst staff do their best to collect everything up before it blows away or gets drenched. The bad weather gives us little incentive to leave, and we prop up the bar, drinking more fantastic beer. Eventually the rain goes away, and we stroll the short distance back to the hotel, and our bed. You can see more photos of this day over on Flickr, and you can dutifully admire all the photos from our holiday in the Switzerland set.